ForexNewsNow – Leading social trading provider eToro has just announced the release of its new Social Trading Index product. The new Social Trading Index will be the first product of its kind on the online trading industry, further strengthening eToro’s reputation as market leader in innovation and technology. The new product was announced today at FinovateFall. The new Social Trading Index will allow traders registered at eToro to create their very own trading indices and share it with the whole eToro community. As explained, so far this is the first product of its kind on the market. At this moment the new product is in its beta testing period and awaits to be finalized based on the initial user reactions and feedback during the upcoming months. The new product is expected to receive a lot of interests from many active of eToro users. Social Forex trading indices can be generated by traders though filtering trader ranking according to various criteria such as drawdown and risk behavior. Based on the generated results, traders will be able to create a list of traders through which user generated social trading indexes can be created. The new Social Trading Index is a development of the renowned CopyTrader technology of eToro. CopyTrader allows online traders to follow and replicate the trades executed by other traders. This way new or inexperienced traders will be able to follow the moves of highly experienced traders and cash in large profits. The CopyTrader was only able to follow and generate reports of only one trader but the new Social Trading Index expansion allows traders to generate trading indices considering the actions of multiple successful online traders. Up until this moment, in order to evaluate the actions of multiple people, traders were forced to separately follow every selected trader and compile the relevant data on their own. Now this is fully automated and will be executed by eToro itself. eToro CEO and founder Johnathan Assia explained that the new product represents a breakthrough in the online trading business. He commented that social trading indices are the next step in the evolution of social trading. Another classy feature of eToro is its mobile compatibility. All the services offered by the venture are also accessible from Android and iOS based devices. A recent Global Banking & Finance review even declared them as the best mobile trading platforms on the market. The apps allow people to check what other traders do in real time and give them the possibility to replicate their trades from the mobile devices. The apps provide traders with live rates, trading history, live news feeds, live eToro OpenBook trading feeds and various other features. Android users are also able to use a newly released free trade signals app. This app will permit traders to receive live trading alerts based on previously established stats and preferences. The company explained that it will continue to improve this service in the future. 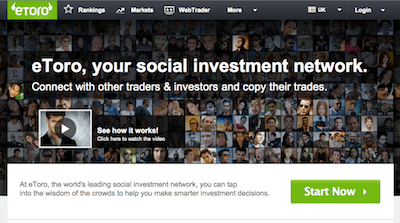 eToro is the world’s biggest social investment network. eToro allows traders to follow various highly successful professionals, or how they call it, “Gurus”, and replicate their actions in order to ensure consistent profits. Experienced traders can also apply to become eToro Gurus and generate additional lucrative income beside their regular trading income.